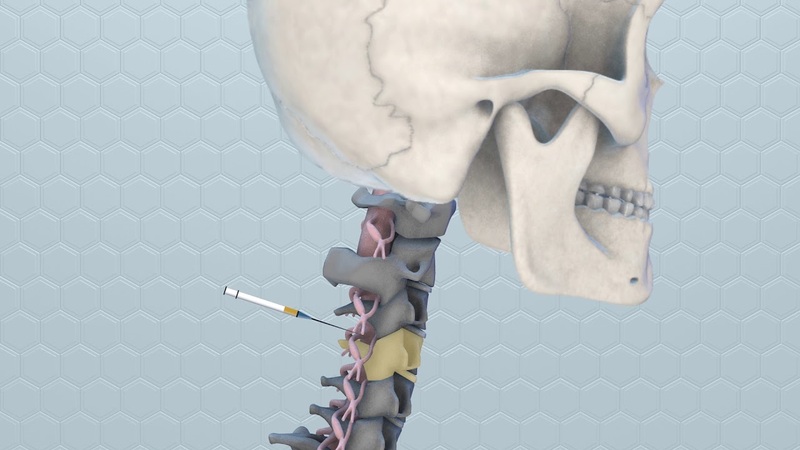 What is a facet injection / rhizotomy? A facet injection includes both a long-lasting corticosteroid (e.g., triamcinolone or methylprednisolone) and an anesthetic numbing agent (e.g., lidocaine or bupivacaine). The drugs are delivered to the painful facet joint, either inside the joint capsule or in the tissue surrounding the joint capsule. Each vertebra has four facet joints, one pair that connects to the vertebra above (superior facets) and one pair that connects to the vertebra below (inferior facets). Corticosteroid injections can reduce inflammation and can be effective when delivered directly into the painful area. The pain relief can last from days to years, allowing you to improve your spinal condition with physical therapy and an exercise program. Facet injections also provide diagnostic information for your physician. The injection “blocks” the pain in the same way a dentist uses an anesthetic injection to block pain in your jaw before working on your teeth. Injections into joints or nerves are sometimes called “blocks.” Successful facet injections may indicate that you could benefit from a facet rhizotomy/radiofrequency ablation – a procedure that uses an electrical current to destroy the nerve fibers carrying pain signals to the brain. Spinal stenosis: A narrowing of the spinal canal and nerve root canal can cause back and leg pain, especially when walking. Sciatica: Pain that courses along the sciatic nerve in the buttocks and down the legs. Can be seen in any level in the lumbar spine, it is most commonly caused by compression of the 5th lumbar or 1st sacral spinal nerves. Arthritis: Joint inflammation caused by degeneration of the cartilage; causes pain, swelling, redness, and restricted movement. Postoperative pain: Acute pain following discectomy or spinal decompression caused by disruption of the facet joint or spine muscles. Facet injections should NOT be performed on people who have an infection, are pregnant, or have bleeding problems. It may slightly elevate the blood sugar levels in patients with diabetes, typically for less than 24 hours. It may also temporarily elevate blood pressure. About 50% of patients experience some degree of pain relief. The pain may be relieved for several days to several months – allowing you to participate in physical therapy. If prior injections were helpful and you experience a recurrence of pain, the procedure can be repeated up to 3-4 times a year. If you don’t experience any pain relief, further injections won’t be helpful. 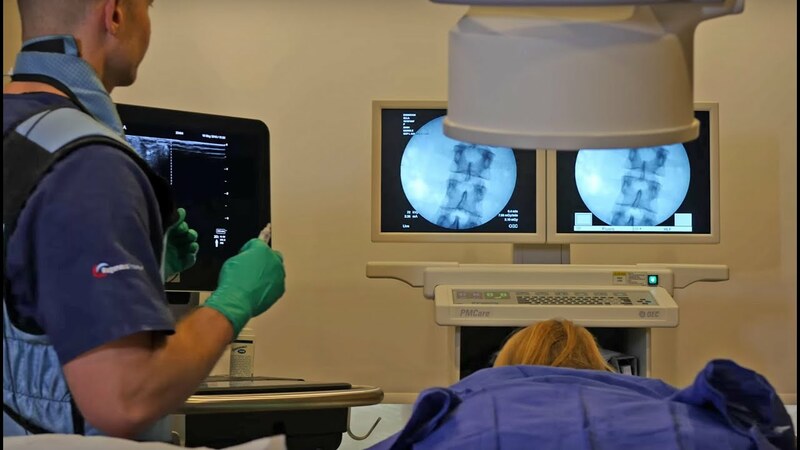 If you suffer recurrent back pain and you’ve experienced good pain relief with facet injections, you may be a candidate for a facet rhizotomy/radiofrequency ablation. Facet rhizotomy/radiofrequency ablation is a procedure that uses a radiofrequency probe to destroy some of the nerve fibers causing pain. During this procedure, an electrode is passed through the skin to the sensory nerves surrounding the facet joint. Once the electrode is in the exact position a radiofrequency heating current is applied to deaden the nerve fibers that carry pain signals to the brain. Once completed the patient can experience roughly 1-2 years of relief (average relief is 15-18 months) and this procedure may be repeated if pain returns. With few risks, facet injections are considered an appropriate nonsurgical treatment for some patients. The potential risks associated with inserting the needle include bleeding, infection, allergic reaction, headache, and nerve damage (rare). Corticosteroid side effects may cause weight gain, water retention, flushing (hot flashes), mood swings or insomnia, and elevated blood sugar levels in diabetics. These usually disappear within 3 days. Patients who are being treated for chronic conditions (e.g. heart disease, diabetes, rheumatoid arthritis, or those who cannot temporarily discontinue anti-clotting medication) should consult their personal physician for a risk assessment.